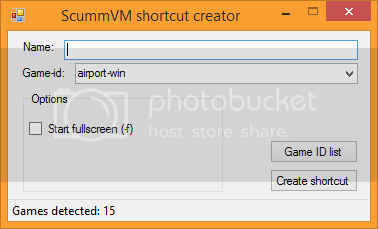 I have created an app for Windows that allows to you easily make desktop shortcuts to your ScummVM games. The app automatically detects your installed ScummVM games, and from there allows you to make desktop shortcuts for them.It also includes a full in app game-id list, so that you can match up your game ids with the game's full title. Any feedback is greatly appreciated. There is also a version for ResidualVM available here. Last edited by sega dude on Tue Sep 01, 2015 4:06 pm, edited 1 time in total. raina wrote: Does it get the list of IDs from ScummVM or is it hardcoded and so automatically requires an update when ScummVM game support expands? The Game id list? It gets them from a file that is included with the program. You could make life easier for you and just read in the scummvm.ini file, all the used and available game ids are in there. That would save you from keeping your extra file updated (because it would happen automatically with every new ScummVM release) and users would only get prompted for the games they've actually installed. Let me clarify. The game ids in the "Game-id" dropdown do come from scummvm.ini in "C:\Users\<Username>\AppData\Roaming\ScummVM". Therefore, it only shows the games the user has installed. The game ids in the table when you click the "Game ID list" button is from the file I mentioned before. This is only there for reference. I think it would be helpful to use ScummVM's naming scheme when it comes to game ids versus target ids/names. Here, "germansky" and "germandott" are the target ids/names (they will also appear in the "--list-targets" output of the ScummVM executable). These are typically used, for example, to run games configured in ScummVM through the command line. I guess this is was you call "game-id". On the other hand. The game id for the target "germansky" is "sky" (i.e. the value of the configuration key "gameid"). On the other hand the game id for target "germandott" is "tentacle". The possible game id values which a version of ScummVM supports/uses can be shown by using "--list-games". Game ids can be used to run games, which are not configured in the ScummVM configuration file, when supplying a path. Please not that there must be no correlation between the target id/name and the game id at all. The user is free to choose a target id/name he wishes (as long as he does not use characters which are not allowed in the section name of an ini file). Could yo do the same thing with ResidualVM, if you don't mind? The work is done yet, I suposse, because ScummVM and ResidualVM use the same code and interface. Anyway, thanks for thw work! MPinillos wrote: That's so cool! Could yo do the same thing with ResidualVM, if you don't mind? I'm sure I can. Unfortunately, my dev machine is out of commission right now, so I won't be able to work on it until I get a new computer. But it shouldn't be too long. The ResidualVM version has been released. You can find the link to it in the original post above.